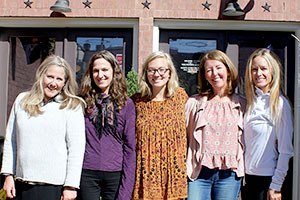 At The Bradley Boulder Inn, Heather Collaton and her hospitality team treat their visitors to a downtown Boulder home away from home, just a block from the Pearl Street Mall. This cozy inn has twelve guest rooms all with private baths, and feature private fireplaces, luxurious linens, and original paintings.The Bradley’s complimentary home-made breakfast every morning and wine & cheese hour each evening make this comfortable Inn a favorite place for a perfect Boulder getaway. Friday afternoon: Check in to your room at The Bradley Inn (request a private fireplace and a mountain view, when you book). We’re just off Pearl at 16th, only a block from the Pearl Street Mall, so put away your car keys because you’ll be walking everywhere in Downtown Boulder from your new home base. Relax. Stroll out to Pearl, browse at Bliss or Momentum, check out the boutiques, or have a pint on the sunny patio at Mountain Sun. At 5pm, enjoy our complimentary Wine & Cheese Hour. Tell us if you’re celebrating a special day and we’ll crack open some Prosecco for a toast! Friday night: For special occasions, we always recommend our guests experience the world-class hospitality of Frasca Food and Wine, just around the corner from The Bradley. But perhaps your celebration includes tickets at eTown Hall (across the street) or Boulder Theater (two blocks away) and you want a quick bite. We recommend restaurants all over downtown but The Bradley is just steps from some of our favorite neighborhood restaurants and bars– Oak, Pizzeria Locale, Zeal, Leaf, the new Emmerson and Mateo. Later, walk back to The Bradley to wind down by a cozy fire. Saturday morning: Wake up to The Bradley’s famous breakfast and let us help you plan your day. Take in a free workout at One Boulder Fitness or walk to the nearby foothills for an invigorating morning hike. Saturday afternoon: Grab a sandwich at Organic Sandwich Company, or have Cured or Dish create a picnic lunch for you that you can take up to Chautauqua or Sanitas. Later, hit the Pearl Street Mall to see what’s happening for the day. Take a mid-day coffee break with some prime people-watching on the patios at The Cup, or Laughing Goat, Boxcar or the new sidewalk bar at Full Cycle Bike Shop, and then it’s back to The Bradley for some fresh baked cookies and to rest up for your Saturday night on the town. It’s easy to convince visitors to stay in Downtown Boulder when the landscape does the talking for you and we're steps from the best shopping, restaurants and theaters! Luxury linens, jacuzzi spas, gourmet breakfast, wine & cheese, health club privileges and free parking are all inclusive in one reasonable rate for lodging downtown. Whether you are searching for home furnishings or handbags, bath products or baby gifts, Momentum offers a unique array of fairly traded products. At Mountain Sun our mission is to offer five-star service, fresh, high quality pub fare and finely crafted brews for affordable prices in an environment that’s comfortable like your living room. Downtown Boulder's health club. Offering full service personal training and corporate memberships. Located in One Boulder Plaza. Full Cycle Bike Shop, Espresso Bar, and Taproom is a two store bicycle retailer headquartered at 1795 Pearl Street.